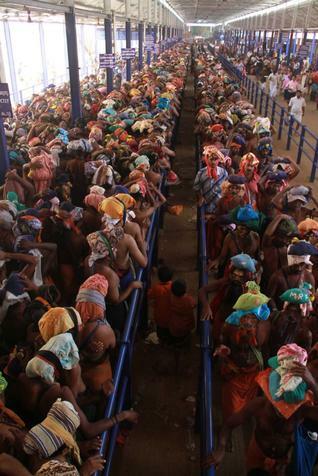 The Sabarimala Ayyappa temple witnessed unprecedented rush as pilgrims in thousands thronged the pilgrim centre on Saturday. The pilgrims had to wait in long-winding barricades for hours together to have the holy darshan. The queue extended beyond Marakkoottom on the traditional trekking path in the afternoon. They had a long wait before the Aravana- Appam counters and before the Nayyabhishekom counters too owing to the heavy rush. The police had a tough time controlling the crowd at the Valiyanadappanthal, Lower Tirumuttom, flyover and the Pathinettampady. The temple was kept open till 1.30 p.m. after the Utchapuja in the backdrop of the rush.